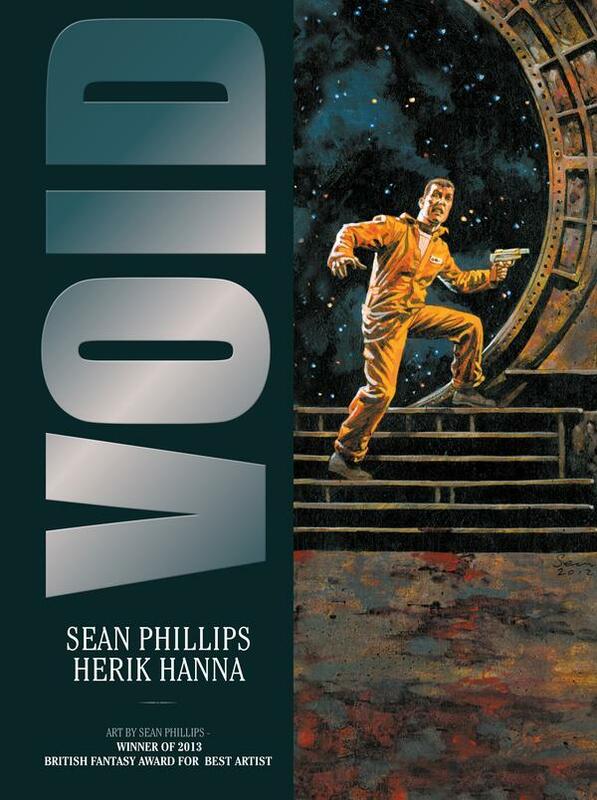 A fast-paced story now translated into English, Titan Comics’ Void sets a new bar for graphic novel thrillers and is a must for fans of Sean Phillips. This is a European comic brought to the North American market done right. A good size, physically and page count, glossy paper stock, hardcover, $9.99 price point. This is what Cinebook should be delivering. A crazed commander has slaughtered everyone aboard a prison ship adrift in space and only our protagonist John seems to be left. 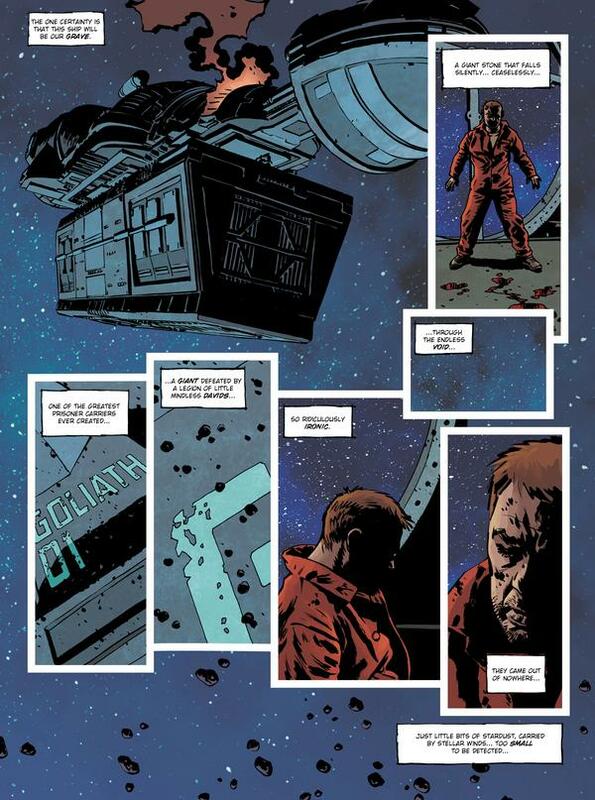 We follow John on his nail-biting journey through the ship as he attempts to stay alive. It’s a classic chase thriller with an interesting twist that for most of us is easily spotted but no less dramatic. Hanna presents a compelling story with a constant, intense pace. Since we only see and interact with John his character develops page by page, small details emerging and the weight of what’s happening taking its toll. Sanity becomes questionable and then things get interesting. Phillips is well known for his crime and drama work and has a clear and developed style. He has a “type” of protagonist and femme fatale and they tend to look similar from book to book, but that doesn’t detract from what’s presented. Bold strong lines, rich blacks, and expressive faces. 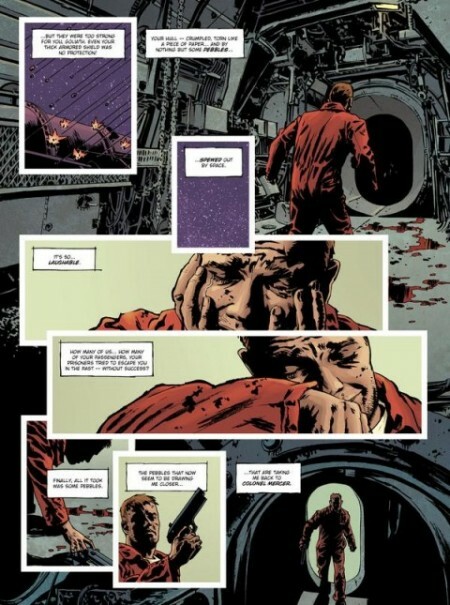 Since the story follows one character and a lot of the dialogue takes place in his head Phillips uses the panels to represent his thoughts. Lots of small overlapping panels and non linear layouts enhancing the tension, presenting a thriller visually, moment by moment. No extras included, but we’re already getting an incredible value here. Ten dollars for this story is a bargain: just go get it.